The only part of the race she remembers is walking out with her teammates, purposely averting her gaze from the stands so she would not see the crowd of spectators about to watch her swim. IU Diving Coach Jeff Huber announced Tuesday morning former USA Diving Head Coach John Wingfield is the new IU assistant diving coach. Dr. Jeff Huber, Indiana University head diving coach, announced today former USA diving head coach John Wingfield as the new IU assistant diving coach. Last weekend, the IU diving team continued its summer competition in Greensboro, N.C. in the AT&T USA Diving National Championships, taking home several top-10 finishes. Several IU swimmers featured their talents at the 2012 U.S. Open Swimming Championships at the IU-Purdue University Indianapolis Natatorium last week. Former IU diver Christina Loukas finished eighth in the Olympic 3-meter springboard finals Sunday afternoon in London. In Beijing in 2008, she placed ninth in the same event. Recent graduate Margaux Farrell swam the second leg of the women's preliminary 4x200 freestyle relay for Team France Wednesday morning, helping her team to a third place finish in the first heat and a spot in the finals. Incoming IU freshman swimmer Haley Lips won two gold medals Tuesday at the YMCA National Long Course Championships in Atlanta, while the men's golf and women's soccer programs named new assistant coaches. 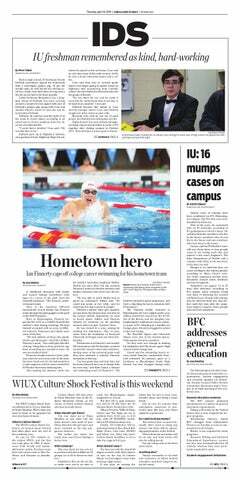 In only a few weeks’ time, former IU diver Christina Loukas will mount her second challenge for a gold medal, knowing full well that a shot at diving’s Holy Grail — her “next year” — will not come again until 2016. Indiana University graduate and 2008 NCAA Champion Ben Hesen came up just short of making the U.S. Olympic team, finishing fourth in the 100-meter backstroke finals Wednesday at the USA Swimming Olympic Trials in Omaha, Neb. Former Hoosier All-American and 2008 NCAA Champion Ben Hesen, has qualified for the 100-meter backstroke finals at the USA Swimming Olympic Trials in Omaha, Neb. IU Athlete of the Year Allysa Vavra came up two-tenths of a second short of advancing past the 400-meter individual medley preliminary round yesterday at the USA Olympic Swimming Trials in Omaha, Neb. The 2012 U.S. Olympic Team Diving Trials came to a close with one former Hoosier, Christina Loukas, qualifying for the 2012 London Olympics after her second place finish in the senior women’s 3m springboard competition. Senior swimmer Allysa Vavra and redshirt junior distance runner Andy Bayer were named the 2012 Indiana Athletes of the Year earlier today. Both Hoosier athletes have a chance to make the U.S. Olympic team during the USA Olympic Trials this week. Recent IU graduate Margaux Farrell has already punched her ticket to this summer’s Olympics, but she might not be the last Hoosier swimmer that makes it to London. Farrell will swim for the French team, but starting Monday, 16 current and former IU swimmers will attempt to make the United States team at the U.S. Olympic Trials in Omaha, Neb. Former Hoosier diver Christina Loukas and partner Kassidy Cook narrowly missed qualifying for the 2012 London Olympics on Thursday, falling less than a half-point shy of wining the women’s synchronized three-meter springboard finals at the USA Diving Olympic Trials in Federal Way, Wash.
IU senior diver Amy Cozad is within striking distance of making the U.S. Olympic team heading into Sunday’s women’s platform final at the USA Diving Olympic Trials, held at the Weyerhauser Aquatic Center in Federal Way, Wash. Led by 2009 graduate Christina Loukas, who competed in the 2008 Beijing Olympics, multiple Hoosiers have booked spots in the finals of their events at the 2012 U.S. Olympic Team Diving Trials, putting them one step closer to competing in London. The road to London just got a little shorter for former IU diver Christina Loukas. The former All-American and 2009 NCAA Champion scored 317.46 points in the women’s three-meter springboard semifinals Wednesday and sits in second place heading into Saturday’s finals at the USA Diving Olympic Trials, held at the Weyerhauser Aquatic Center in Federal Way, Wash.
Two pairs of former Hoosier divers will compete in the women’s three-meter synchronized finals on Thursday at the 2012 USA Diving Olympic Trials in Federal Way, Wash.